UK Cheese Auto is a successful replica of the parents Critical + Auto and Cheese. The intense mature cheese aroma of the mother has been accurately fixed, the use of anti-odor filters being necessary. It is a marijuana plant that yields plenty of dense buds brimming with top-quality resin. 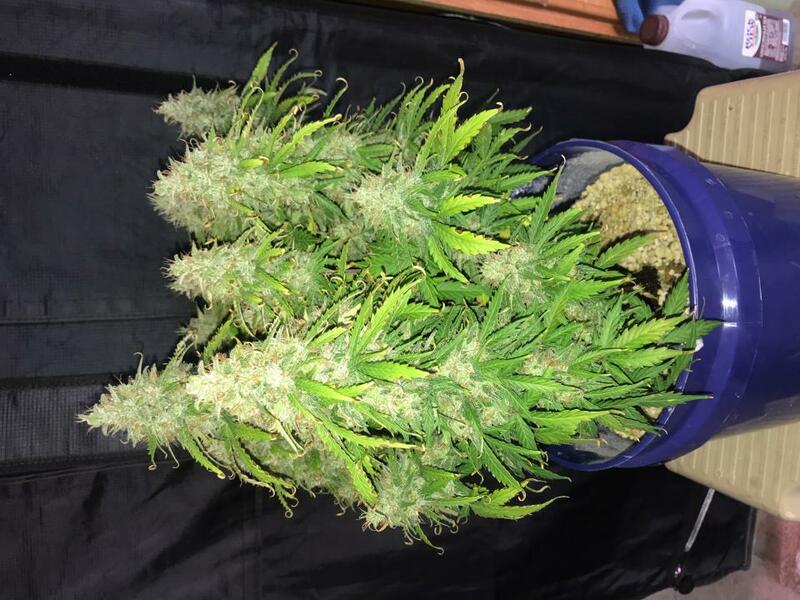 Just like any other autoflowering cannabis seed, it is a great choice for small indoor spaces. UK Cheese Auto is a marijuana plant that encapsulates fan aromas and an extremely strong flavor of blue cheese. The effect is balanced and powerful, taking you to a state of intense body relaxation. An autoflowering cannabis hybrid that faithfully reflects the exceptional qualities of its predecessor. Finished a grow and am exceptionally happy with the results. First I grew in a 100%Perlite Hempy grow. Second used a Perfect Sun Mini LED 24hrs from start to finish. Harvested at 79days from sprouting. Dried for 7 days, and cured for 6weeks. Now at 3months since harvest and the smoke has continued to improve. Beautiful aroma of light cheese, great lite cheese taste. Yield was 59grams indoors in a 2x2 tent. I'm ordering another three seeds today. Received the uk cheese auto as a gift to try. I must admit i was skeptical as my past relation with autos has not been anything to boast about. [low yield small plants ]. Humboldt seed organization has both impressed me and made me believe in their products. my uk cheese auto is a nice size yielding well. the aroma , size, and crystal covered buds are making me drool with anticipation. [a week or so from harvest]. cannot wait to try them, but already know from the looks and smell that it is going to be awesome. i would like to both thank you and tip my hat in respect to Humboldt seed organization, for such a fine product. you have given me an auto i can believe in, and want to purchase more of. i look forward to trying your other products too. keep up the dam fine job and work. respectfully, james. Easy to grow even for novices. Don't drown it, feed it reasonably well, and you'll have great plants to fill empty spaces between your photoperiod ones. I'll write one more review when completed. 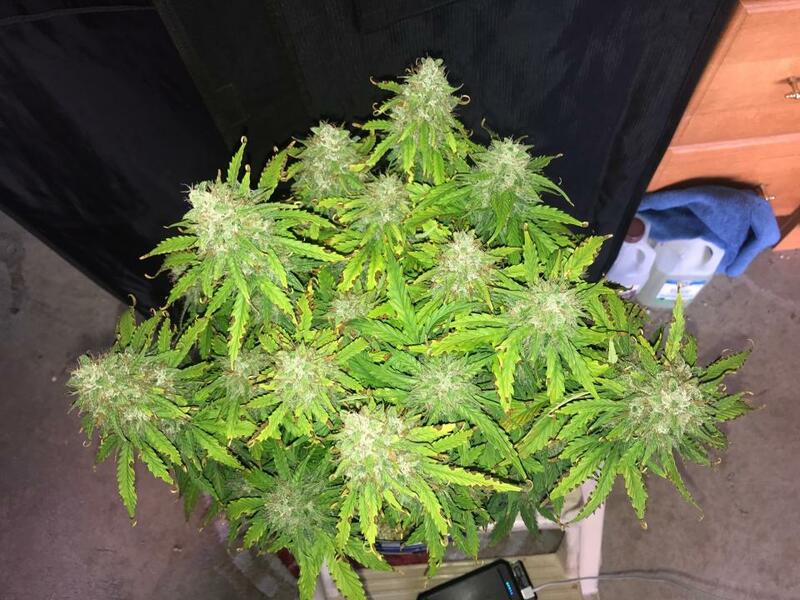 So, why no 5 stars for this "Autoflower"? Because HSO writes this is a Sativa / Indica hhybrid, which it is, but then forgets to tell that there's Ruderalis in it too. Would be the first Autoflower without Ruderalis that I have ever heard of, so why doesn't HSO correct this little mistake, now that I made them aware of it. ;) It's important that HSO continues with solid user - customer information. Very surprised at this plant....as wide as tall and being harvested in 2 stages. First stage down day 68 and about 4 oz. Second stage (lower buds) maturing slower but expect another 2 oz+. Buds very firm and coloring nicely at the end. Definitely with cheesy overtones in smell. Easy to grow and nicely greasy/sticky. A very nice surprise! Lots of potential in this Lil Auto ,she's a very fast finisher that produces lots of frosty Bud's in a very short time...if your a Fan of UK's Cheese like I am your going to love this Version by Humboldt..